TDP-Congress Mahakutami alliance is pitted against K. Chandrasekhar Rao’s popularity in poll-bound Telangana. 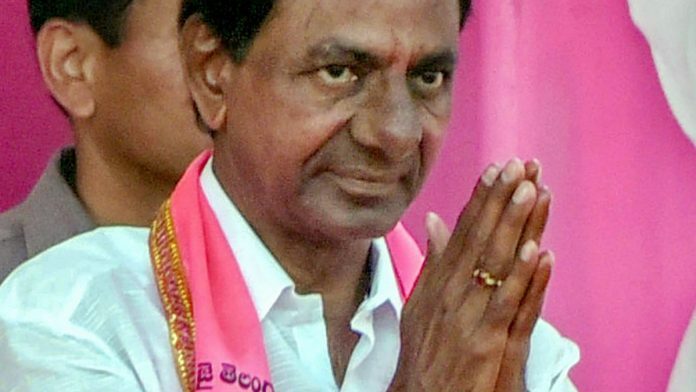 When K. Chandrasekhar Rao decided to call for early elections in September this year, almost everyone described it as a politically astute move. Since then, the Congress and the Telugu Desam Party (TDP) – arch-rivals in Andhra politics for decades – decided to take on K. Chandrasekhar Rao (KCR) by forming a Mahakutami (grand alliance). The new narrative coming out from the field reports on Telangana suggests that Mahakutami has emerged as a formidable challenger to KCR. What prompted the TDP to enter into an alliance with the Congress in Telangana? Will this Mahakutami, which also includes Telangana Jana Samithi and the Communist Party of India, foil KCR’s re-election bid? And, what would be the after-effects of Telangana results on Andhra Pradesh assembly election, scheduled to be held along with the Lok Sabha elections? The joint rally by TDP chief and Andhra Pradesh chief minister N. Chandrababu Naidu and Congress president Rahul Gandhi a week ago brings a closure to the politics of regional pride initiated by Naidu’s father-in-law N.T. Rama Rao (the iconic Telugu movie actor) against what was described as the high-handedness of Congress high command in dealing with then-state chief minister T. Anjaiah. Naidu around that time had just left the Congress party and joined the TDP. Since then, Andhra politics revolved around these two parties with a minor presence of the BJP and All India Majlis-e-Ittehadul Muslimeen (AIMIM) in greater Hyderabad region. In 2001, KCR, a former Congressman who had joined TDP in 1983, broke ranks with Naidu and formed a new party – Telangana Rashtra Samithi (TRS). The bifurcation of the state in 2014 brought a dramatic shift to the established system of party competition (See Figure 1). 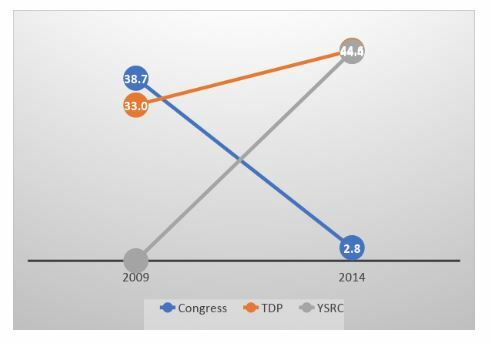 The Congress got decimated in Andhra Pradesh owing to anti-bifurcation sentiment and a majority of its state unit shifting to a different party – YSR Congress – led by Jaganmohan Reddy. The party, however, retained a large portion of its vote in Telangana region and emerged as the principal opposition party after the election in which TRS had attained a simple majority with just under 35 per cent votes. The TDP, on the other hand, managed to come to power in Andhra Pradesh but remained a distant third in Telangana. In our view, arch-rivals Congress and TDP have joined hands in Telangana because neither of these two parties can pull off a victory on their own in their respective states. While the Congress was in no position to single-handedly take on the TRS in Telangana, Chandrababu Naidu seems to be hoping that the experiment leads to a similar understanding in Andhra Pradesh where he needs to thwart the emerging challenge from YSR Congress. This expectation from Mahakutami partners helping the TDP in Andhra may also explain why the TDP is happy playing second fiddle to the Congress in Telangana and contesting 13 of 119 seats in the state. In the 2014 assembly election, the Congress won approximately 25 per cent of votes in Telangana. Although the overall public sentiment in the state was favourable towards the Congress for its role in the bifurcation of the state, the party could not turn this sympathy into votes. 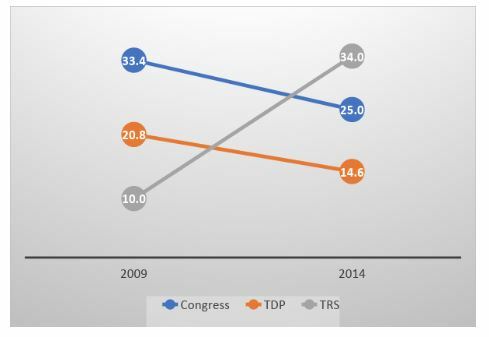 In the National Election Study (NES) 2014 conducted by Lokniti-CSDS, almost half the respondents (44 per cent) from Telangana credited either the central government, the Congress party’s top leadership or state leaders for the bifurcation. The Congress, however, did succeed in emerging as the primary alternative to the TRS in the state, whereas the TDP, due to its frequent flip-flops on the bifurcation issue, remains a marginal player in the region. How has the game changed in Telangana as a consequence of this alliance? The TDP-Congress alliance’s arithmetic in this election is pitted against KCR’s popularity as a leader and a slew of welfare programmes launched by his government. In a survey conducted by the Lokniti-CSDS in May 2018, there was a positive appraisal of the KCR government’s performance. More than half of the respondents in the state (54 per cent) said that they were satisfied with the state government’s performance. Also, KCR’s popularity is likely to work in the TRS’s favour as the opposition does not have a similar face to match. Can the TDP provide adequate support to help the Congress in crossing the half-way mark? The TDP is a marginal player in Telangana politics, and it’s unlikely that its performance will make or break Mahakutami’s chances. In the past four elections, the TDP has contested along with an ally. Its strength in the region on its own remains yet to be tested. In the early 2000s, the TDP relied on the BJP’s support base in Telangana region to maximise seat conversion and later in 2009, the party endorsed the creation of Telangana and allied with the TRS. The TDP again allied with the BJP in 2014 but since then the party has weakened further as 12 of its 15 MLAs crossed over to the TRS. In sharp contrast to Telangana, the Congress is now a pale shadow of its former self in Andhra Pradesh. At best, the party can hope to marginally improve its vote share. Chandrababu Naidu’s party emerged victorious in 2014 due to two factors: the vertical division in the Congress in the state and its alliance with the BJP. The TDP severed its ties with the BJP early this year to fight the battle for Andhra assembly against the YSR Congress next year. A helping hand from Mahakutami partners may ease Naidu’s re-election bid. Thus, along with KCR’s political future, how Telangana votes on 7 December would also decide Naidu’s re-election chances. The authors are PhD students in political science at the University of California at Berkeley, US.